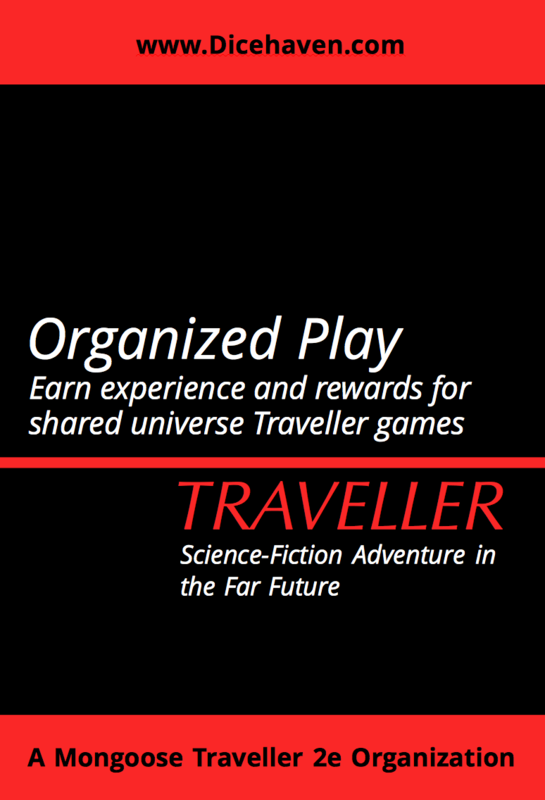 Inspired by Adrian Romero’s blog post at http://redbox.wikidot.com/meta-traveller-acheivements, here is a system of Organized Play I’m proposing for upcoming Dicehaven Traveller games. [Update: after consulting with Mason we determined the XP and Bennies sort of ‘break’ the hard sci-fi feel of Traveller, so we won’t be using the XP/Bennies parts, although we will be doing the shared universe]. There will be a shared Imperium universe. If we have multiple campaigns, mini-campaigns, or one-shots, they all take place in a common Imperium setting. GM’s normally should select a different subsector and will have full freedom of play in those isolated areas of the galaxy. To prevent disrupting other concurrent campaigns, GMs should not introduce setting-wide events (such as extinct-events, new sentient species, secret origins of a species, or a civil war that spans the Imperium) unless first consulting other current GMs. Other universes and IPs (such as Star Trek or Firefly) also qualify for Organized Play and player rewards so long as 1) the group approves and 2) the games use some version of the Traveller rules. Imperium players accomplish earn experience points (XP) and increase their Imperium Player Level. Player receive Bennie levels at levels 1, 3, 5, and 7. These bennies can be used in any Imperium game. A player at level 5 had 3 bennies, meaning each game they start with 3 bennies they can use in all Organized Play games. At levels 2, 4, and 6, the players receive a Windfall which is cash or another benefit they can apply to the single character of their choice. A player who achieves 251 or more XP immediately loses 250 XP and again becomes a Level 1 Player. The player should consider retiring their most experience character, though this is optional. These work similar to Savage Worlds bennies — you get +2 or a reroll on any die roll (but you can keep the better of your two die rolls). Roll on the Windfall table. Reroll any result that you’ve achieved before during your current level progression. Apply Windfall results to the character of your choice. A player can have a Major Goal for each character. You can have at most one Major goal at a time for a character, and can replace it with a new goal after the current one is resolved. Three or more players may determine a Major Goal for their team. The characters must have been been together for at least one game session. I am intrigued by this. Sorry, but I’m a first-time visitor. I’m not sure what a Dicehaven game is. Is it just a game where GMs send email reports to you or do you have a physical location? That’s cool. I have to find enough people to start something similar up in Washington.